Preppy Pink Crocodile: I Scream, You Scream, We All Scream For Ice Cream! I love ice cream. I LOVE ICE CREAM! There. I said it. It's true. I love the rich, creamy, cold yumminess of a great scoop of ice cream. I love Ben and I love Jerry. And if there is an heir to the Haagan Daz throne, is he single and can I sign up to be Mrs. Haagan Daz? Up here in Unpreppy Upstate NY, there are lots of darling little ice cream stands. Many even make their own ice cream. Boutique ice cream, if you will. My favorite place up here is Moxie's. Way out in the middle of nowhere country. You wait in line for 20-30 minutes. But you need that much time to decide which creative recipe you want to try. On Monday we went for the first time this season and I tried Banana Blueberry. OMG! To die for! I love that the woman who owns the stand does this for fun. She is a teacher overseas. But her family has owned the stand for generations and she comes back every spring (it is really still spring up here) and summer to make ice cream for the masses (OK- not masses by most standards- but there are truly always lines of people waiting for that perfect scoop) because she really loves it. Her recipes change daily. And she makes what she feels like making. So if you like something- get it now or you may never see it again. She is an ice cream artist, if there is such a thing. But for those nights when I face the fact that I will be in several upcoming weddings (including one for my sorority little sister, J, in Hawaii), I have found a suitable substitution. OK, so nothing is "just as good" as the real thing. 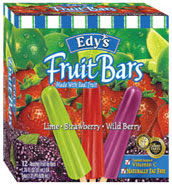 But these Edy's Fruit Bars are a solid second place. They come in the best flavors (my favs are coconut (3 g fat) and strawberry (ZERO fat!!)) and are the perfect size (I like the bars but could not get that picture to come out well so you are looking at the pops). And what's more- the fact that I am even eating ice cream and frozen fruit bars means that it is warm-even HOT- up here. Ding dong, the snow is gone. I am loving every sunny, warm moment of summer after our seemingly endless winter! Where is Moxie's? I spent a few weeks outside of Syracuse and I remember hearing about the delicious ice creams! I've never had the fruit pops, but I'm totally with you on the fruit bars. Yum. Moxie's is closer to the Albany area. I think that makes it a good 4+ hours from Syracuse. But if you are there again- ask the locals. I'm sure there are other super fun ice cream places around there too. They are just everywhere up here. Yum! I am in love with baskin and robbins - all 31 flavors! I love these pops too though! Yum, will have to try! Shoes Make a Great Gift!